You should use knowledge of stock market trend and apply this knowledge into your position size calculator for your trading system and strategies. This is important for all kinds of traders : swing traders, position traders and day traders. The knowledge of current long term trend and also short term trend of major stock market indexes like the S&P500, the Nasdaq 100 index or the Russell 2000 index is an advantage for every short term trader. Yet even this there are many traders that are trying to trade against a prevailing stock market trend. You should know when it’s better to be aggressive and when it’s better to be conservative. And one very important fact for every trader to know is when to stay out of the market without any opened trades. There are trend situations when it is good to approach online trading in aggressive manner and when to hold back. Therefore it is very important to incorporate regular analysis of a stock market trend into your trading plan. If a trader uses same size of a trade any any market trend situation then it leads to mistakes. And even a trader will make good number of profitable trades it could lead to weekly or monthly losses on his/her brokerage account. In this stage of market trend it’s good to use the full position defined by your money management rules for long trades. Preferable strategies are bullish trades. It is possible to trade breakouts or pullbacks but only on the long side. It is very risky to trade short sell trades in this stage of the market index movement. 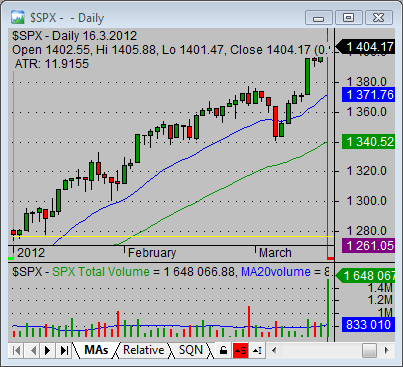 The price chart of the S&P500 market index shows a very bullish situation. This is the phase that’s preferable in a long bullish trade. There is much better to use a pullback stock trade type and use picks that were found by a really good pullback stock screener. Short trades are possible too but with half-position size. 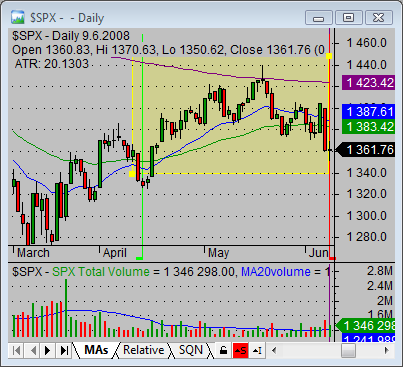 And bearish picks for this trend situation of major indexes must show the biggest relative weakness. Traders should prefer short trades with a full-position size. 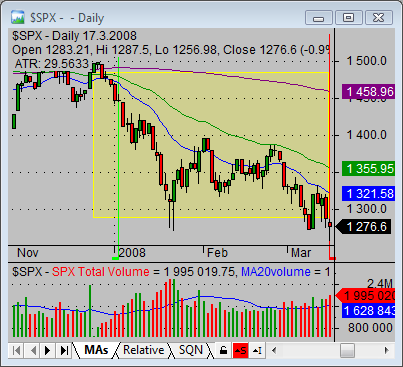 It is possible to trade breakdowns or pullbacks but only on a short sell side. There is very risky to trade bullish long trades in this negative index trend. 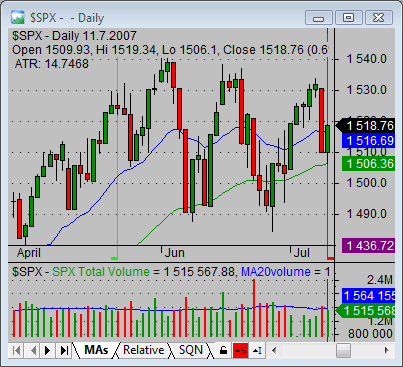 The value of major indexes are well below all key moving averages in this scenario. Traders should prefer short trade strategies. The pullback strategy is the best option for this situation. It is better to have a good pullback screener for short sell pullback picks for your disposal. A bullish trades could be traded too, but use smaller position size for an each stock. And use a good stock screener that finds really the best and strongest picks in such situation. There are situations in the market when it’s better to wait for a new trade setup. Do not chase already moving stocks. It’s better to wait and be patient. There is nothing wrong with it. Private traders have some advantages to professionals that have to be invested every day. The stock market is changing all the time. Regular analysis of a trend situation can improve your trading results very much.